This is a very easy one pot chicken dish that you can leave to cook in the oven. It's also great for using up any leftover bread. Serve with any seasonal green vegetables. Heat half the oil in a large frying pan and fry the onion, leeks and squash for about 5 minutes, then remove from the pan. Add the remainder of the oil and fry the chicken pieces until browned. Add the onion, leeks and squash back to the pan and stir in the cream and thyme. Season with salt and pepper and transfer to an oven proof casserole dish. 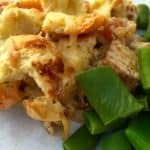 Break the crusty bread into bite sized chunks and sprinkle over the top of the casserole together with the grated cheese. Bring a large pan of water to the boil and simmer the green beans for 3 - 4 minutes until tender. Serve the gratin with the green beans.